The first Latvian congregation in London (Londonas Latviešu draudze) was established in 1945, shortly after the end of the Second World War, with a pastor who had just arrived via Sweden. The members of this first congregation were from the small group of Latvians who were then living in the London area, including the diplomats who had spent the war years in this country. Latvians who had fled from their country before the advancing Soviet Army arrived in Britain in much greater numbers in the years 1946-8. They came, together with members of other nationalities from eastern and central Europe, as so-called European Volunteer Workers from the Displaced Persons’ camps in Germany. Among them were a number of Lutheran pastors, and a second Latvian congregation (Miera draudze) was established in London in 1948. Both congregations held services at various locations in London and the South-East. In 1953, the original London Latvian congregation started to lease Rowfant House in the Sussex countryside near Crawley and held some of its services in the chapel there. In 1961 it was able to purchase this property. The second congregation (Miera draudze) together with the Estonian congregation started to use the church of St Anne and St Agnes after the completion of its restoration from war damage in 1966. The two Latvian congregations united in 1994. Services are now held both at Rowfant House and at Ulrika Eleonora Swedish Church in London. 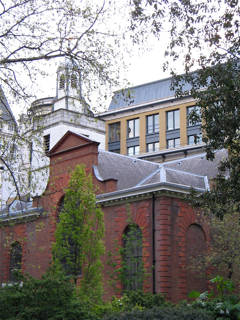 The United London Latvian Church belongs to the Latvian Lutheran Church in Great Britain and, through it, to the Latvian Lutheran Church Abroad, which maintains close links with the Lutheran Church in Latvia but is organisationally separate from it. The London congregation has two sister congregations in Latvia, in the parishes of Zaļenieki and Līvāni, with which it maintains contacts and which it supports with donations. The majority of the membership of the United Lo ndon Latvian Lutheran Church consists of the now elderly first-generation immigrants. However, there are also second-generation and third-generation members supplemented by Latvians who have moved to London from other countries. A significant development since the collapse of the Soviet empire in 1991 has been the arrival in England, and especially in London, of Latvians who come here to work or study for a few months or years or to live here on a more permanent basis. A number of them participate in the activities of the congregation, and some have been confirmed as full members.